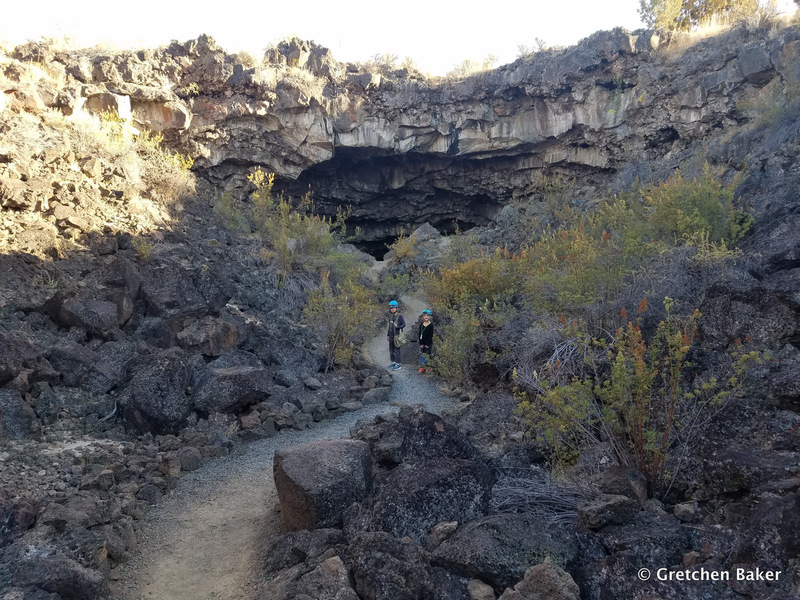 Last September I had a chance to visit Lava Beds National Monument, and I loved it so much I wanted to take the kids back. 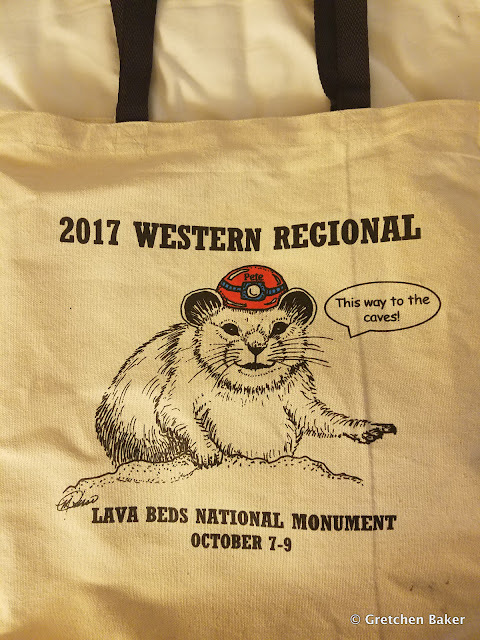 We had the opportunity to do so in early October for the NSS Western Regional, a gathering of cavers. This area is very quiet most of the time. 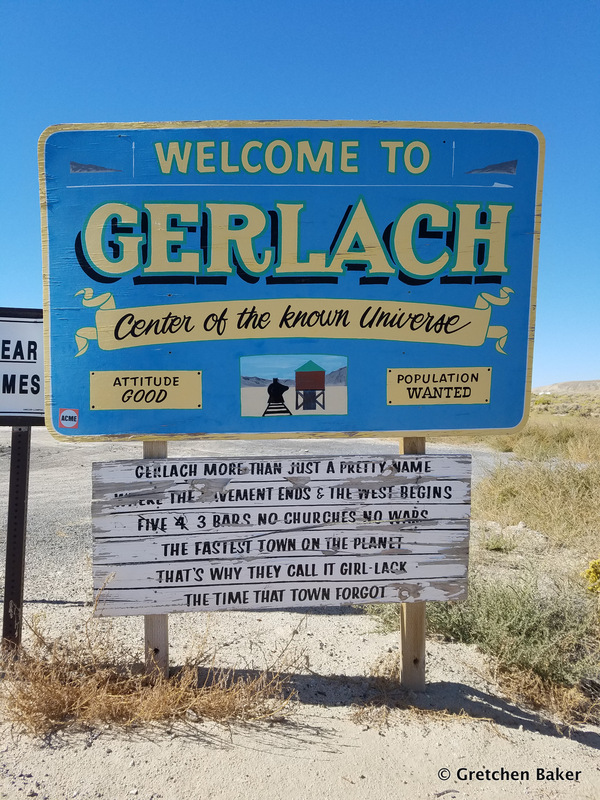 We reached Gerlach about lunch time, and I loved their welcome sign so much that I stopped to take a photo of it. After all, how often are you in the Center of the known Universe? We ate lunch and found out that about 120 people live in the town year round, but they see about 80,000 visitors around Labor Day week, when the annual Burning Man Festival is held on the nearby Black Rock Desert. We took more empty roads, crossed into California (without a sign, so it was several miles before we realized it), and passed through some scenic towns. Eventually we arrived at Lava Beds National Monument in time to get our caving pass (to ensure that White-nose Syndrome isn't spread), set up our tent, and register for the regional. 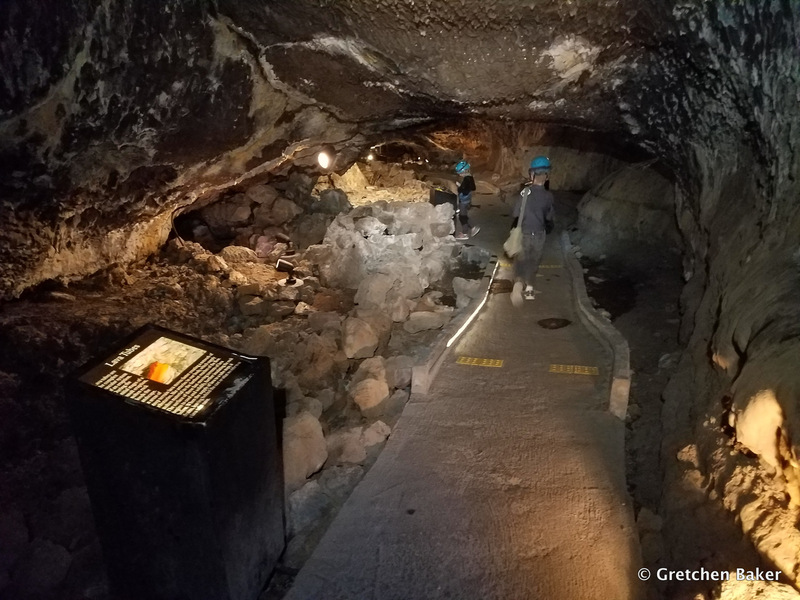 Our first cave was Mushpot Cave, the only lava tube that has lights and a paved trail in it. There are also nice interpretive signs explaining how lava tubes are formed and features in them. 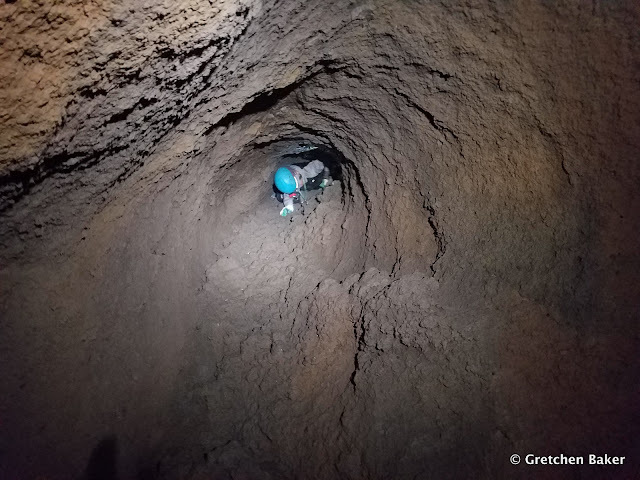 This is the most-visited cave in the park, but we had it all to ourselves. It shows some great lava features. Can you imagine when the lava was flowing through here? We crossed the road and went into Indian Wells Cave, which used to be a watering hole. We didn't find any water on our visit. But the entrance was gorgeous, and we had fun popping out a different entrance. The kids loved the chance to lead and explore. We met up with friends and had a lovely evening. The next day we joined a group going to Catacombs Cave. A four-hour trip to do the loop. It involved some route-finding and a lot of crawling, but we made it! Here's one of the kids in the tight connection section. And a cool root. 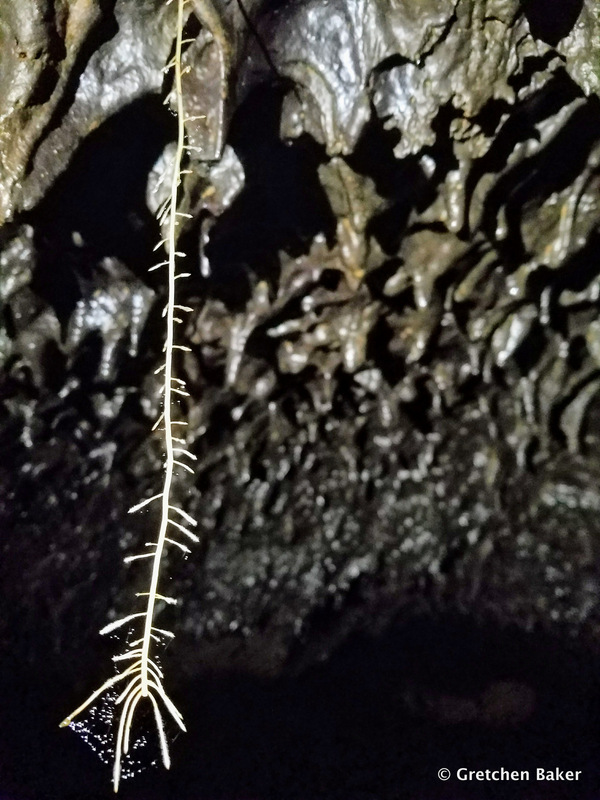 Most of these lava tubes aren't very far below the surface, so roots aren't too much of a surprise. This one was cool because it had a spider web on it with some condensation. We ate lunch in the parking lot and then headed to some more caves along the Cave Loop. 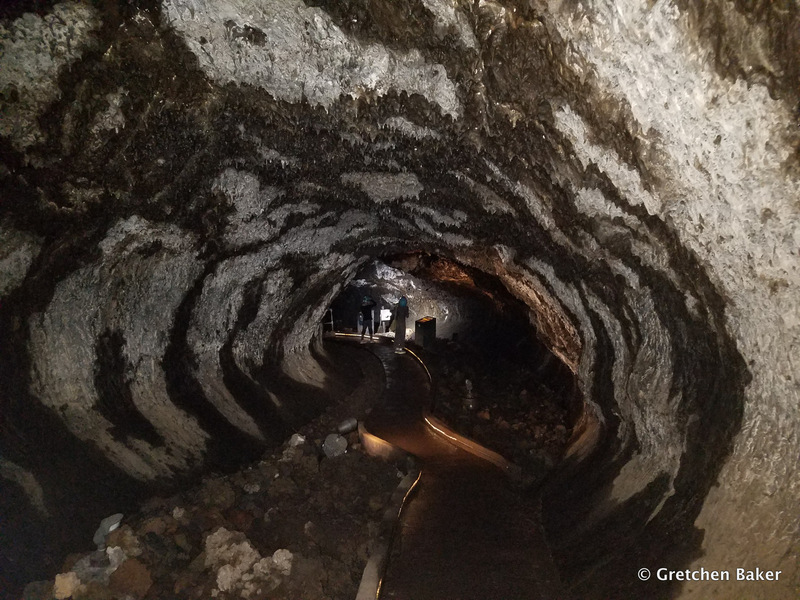 I wanted to check out some caves that are usually closed due to bats. Here is Ovis Cave. We ended up coming out a different entrance, wandered across the road, and went into Sunshine Cave. Then we walked back down the road and checked out Paradise Alley, which runs parallel and slightly higher than Ovis Cave. There's a lookout at one point, with a strong breeze blowing up. This may have been one of the cave entrances, they sort of blend together after awhile! It is such a fun place to explore, with cave entrances all over. 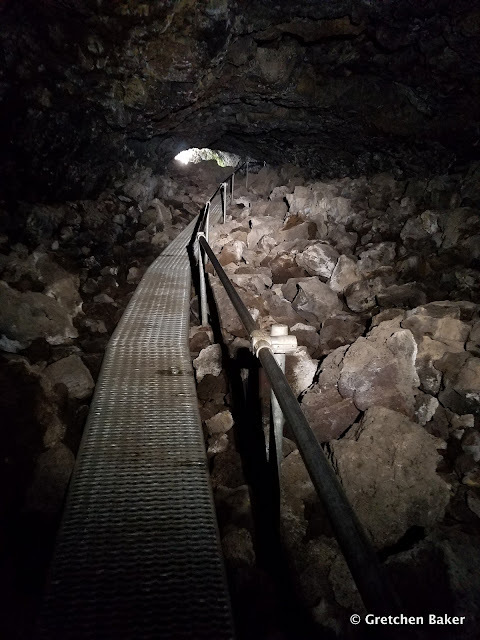 The CCC improved trails in many of the lava tubes in the 1930s, making them relatively easy to walk in. Some from our group went to the Western Regional business meeting. The kids climbed trees for a bit and then were ready to explore again. I wanted to show them the amazing Skull Cave, one of the few caves left with ice in it. About twelve have lost their ice in recent years. And then the passage seems even bigger. Can you even see the kids? We went down steep staircases to get to the lower level. And then we reached the gate. On the other side we could see the ice. Although the ice in most of the lava tubes is shrinking, one resource manager told me that the ice in Skull Cave is actually increasing, and they don't know why. Next we headed further north, seeing so much more lava! 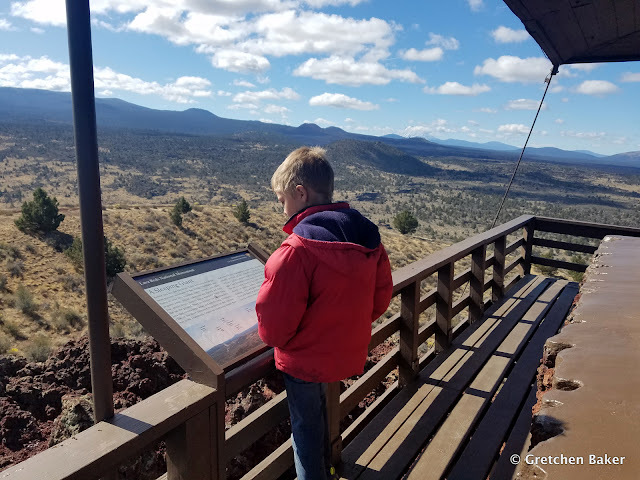 We stopped at pretty much every scenic overlook to see what was there. Below we could see Schonchin Butte in the distance, and the Devil's Homestead Flow right in front of us. We also learned about the Modoc War, which started in 1872, when troops from Fort Klamath tried to force the Modoc from their tribal lands back to the reservation in Oregon. The Modoc hid in the lava. In April 1873 peace talks began, but they did not go well. The Modoc retaliated for the slaughter of 30 members of their tribe and killed two peace commissioners. 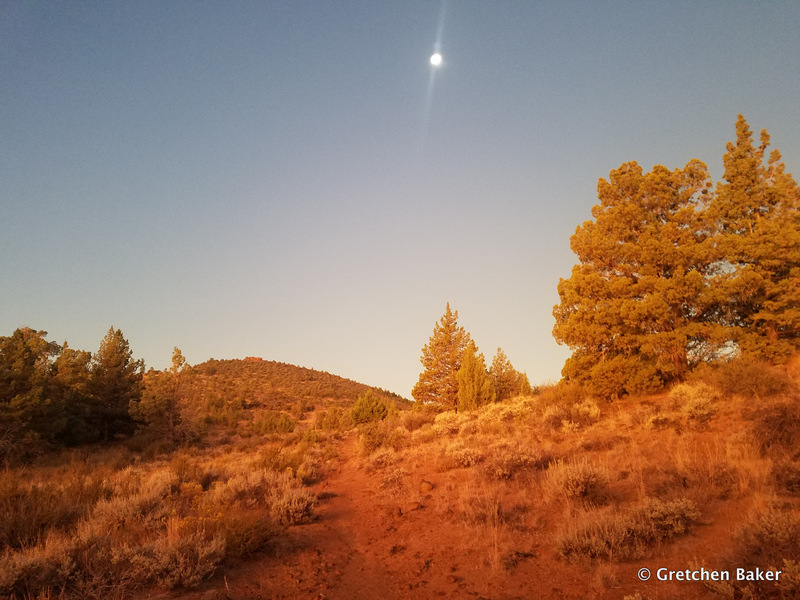 For the next six months, 1,000 troops and volunteers sought to capture fewer than 60 Modoc warriors and their families. The Modoc were then sent to Oklahoma. 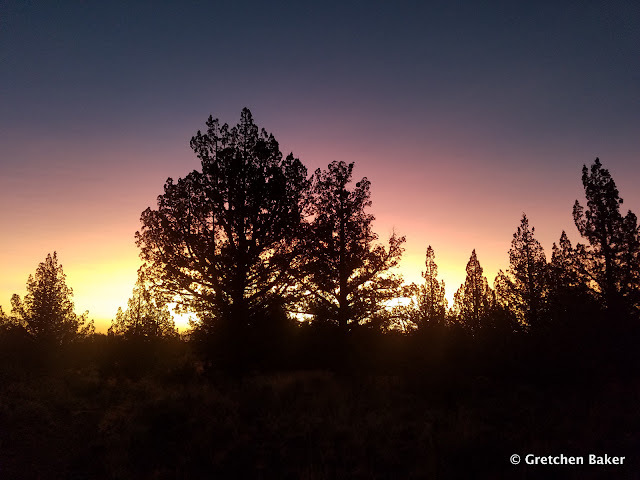 It was rather sad to contemplate that story, with the Modoc being forced off their lands. 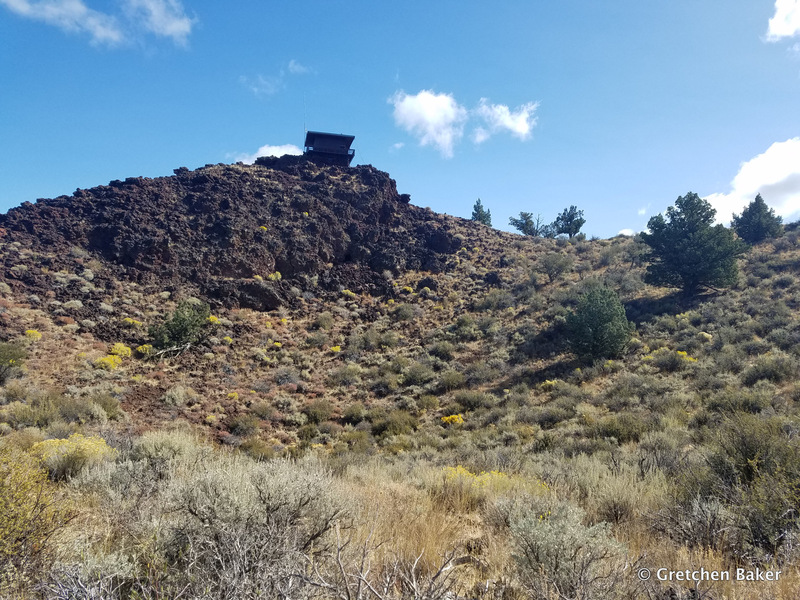 We found some peace at the West Wildlife Overlook, looking into Tule Lake National Wildlife Refuge. Thousands of birds dotted the water. It was getting late in the day and the light was gorgeous. As we came back to Schonchin Butte, we could see the fire tower in silhouette. That night we had the big banquet, a delicious dinner put on by the Motherlode Grotto. Afterwards we intended to stay for some of the entertainment, but the cold temperatures and busy day had us heading to the tent. I woke early and went for a lovely walk along the Bunchgrass Trail. The sun came up and painted everything golden with the sun still in the sky. 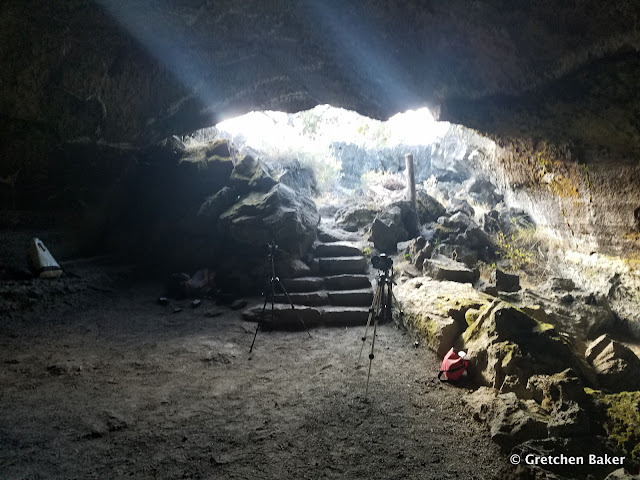 Our plan for that day started with a Photography Trip with Dave Bunnell into Valentine Cave. When we arrived, a couple tripods were already set up near the entrance. The kids offered to be models. 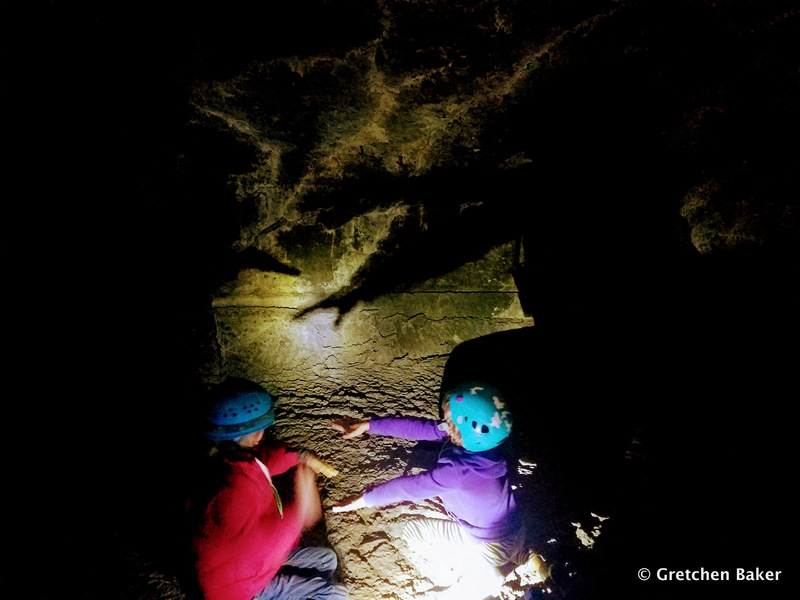 But they quickly decided they'd rather be cave exploring! So as we went through the cave, they posed, but not for long. It was fun working with other photographers seeing how to place lights. Cave photography is all about the lighting. 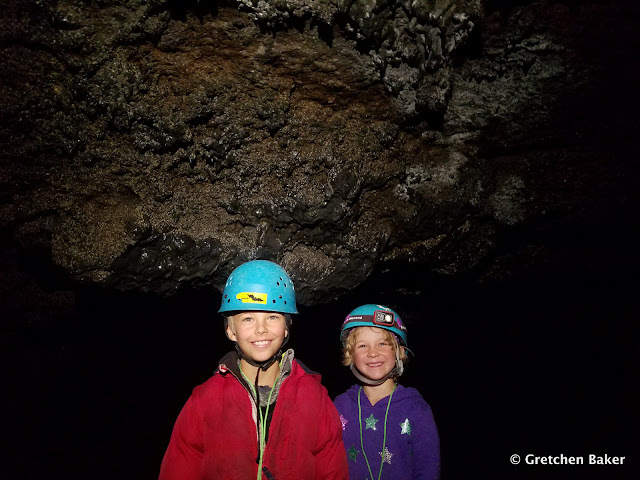 But sometimes the best shot is happy kids in a cave! 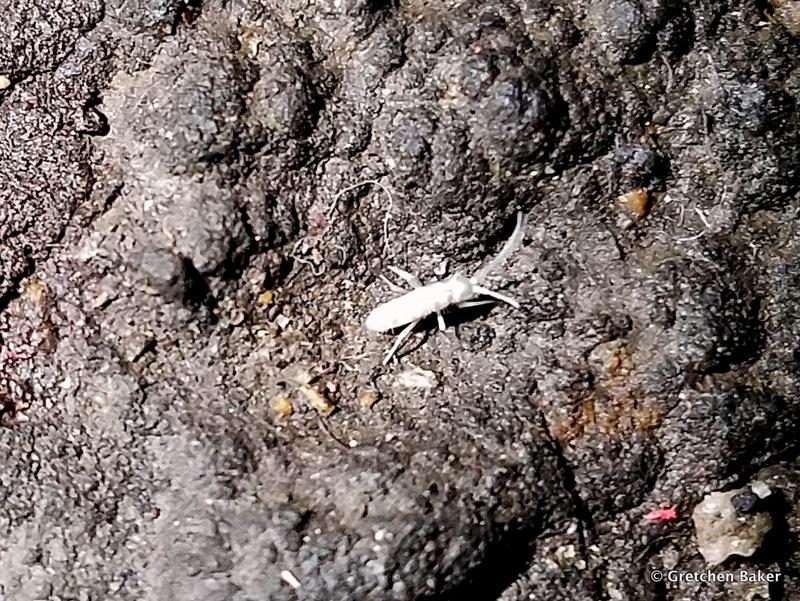 We found a white springtail, which made me happy. And then on to a few more photos. The kids found that it was really fun to make shadow puppets on the lava tube walls. Love all this walking passage! They eventually got tired of the cave and we headed out. 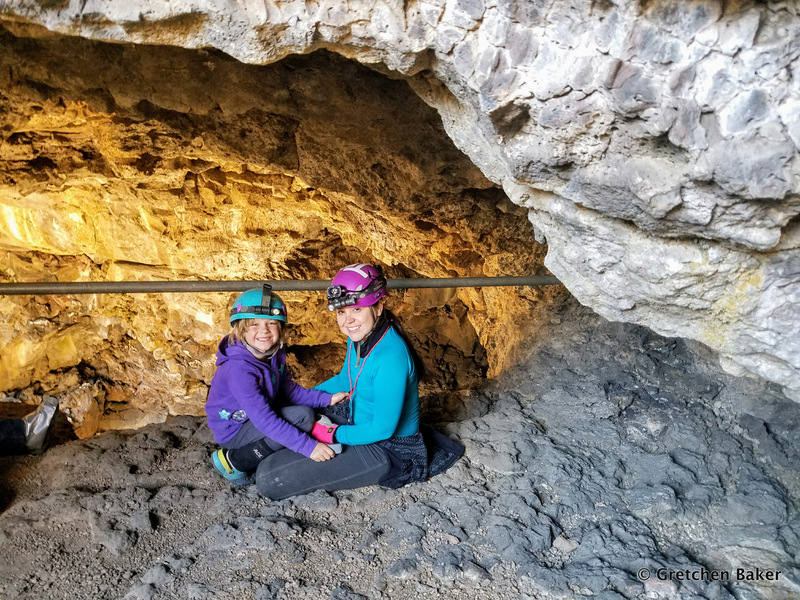 They weren't too interested in doing other caves, but they thought it would be fun to climb to the fire lookout, less than a mile each way. We still had a little time before our 2 p.m. departure time, so we went over to Merrill Cave. It used to be an ice cave, and in fact there are photos of people ice skating on the ice. But it's all gone now. The trail through the cave was very nice. 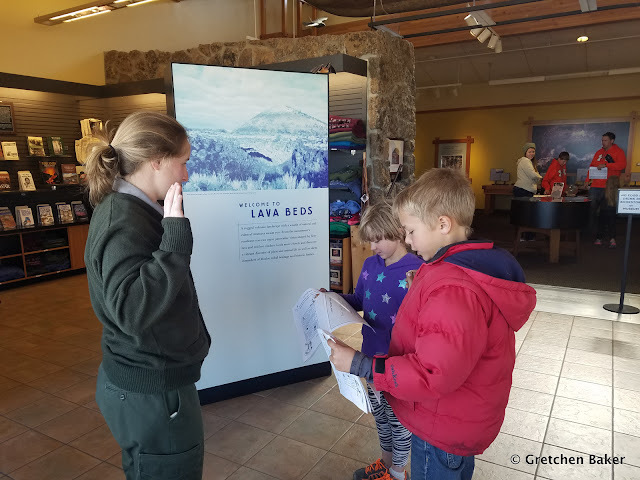 The kids had completed their junior ranger booklets, so we went to the visitor center. Ranger Jillian swore them in. We couldn't resist driving the 1.5-mile long cave loop one more time. And I might not have resisted a quick stop at Blue Grotto Cave. Which just happens to be a fairly long cave. And it was extra memorable when our lights started going out. 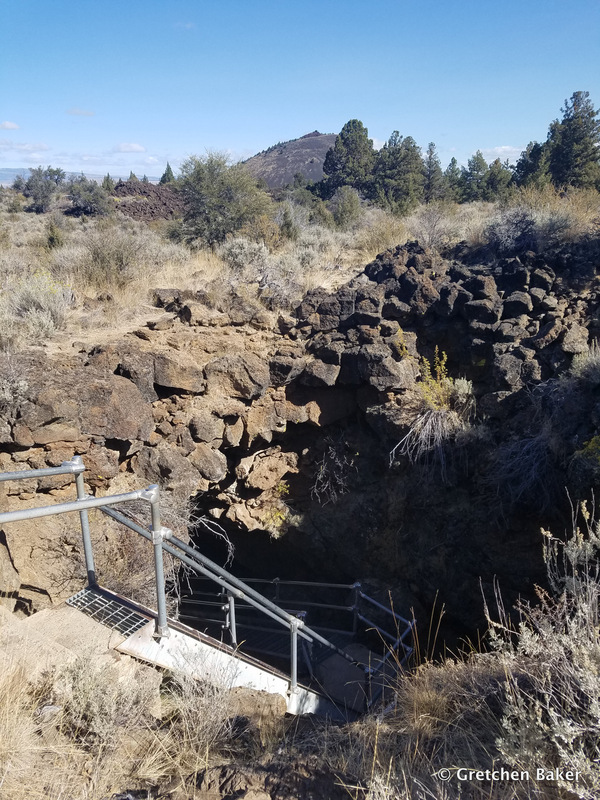 It was a long drive, but Lava Beds was worth it. I would happily return, there is still so much more to see! Hi again..Enjoyed the pictures of the caves and your other adventures.